From a Strutters press release: The Strutters will return to DCI Division III for 2005. Director Dennie Hirsch says, "Drum Corps needs to make a come back in Alberta, and the rest of Canada for that matter. Doing Fusion last year was a huge success and proves to the world that a great product can come out of Canada." The Strutters are taking the success Fusion had and building on it, to create an even better drum corps for 2005. Hirsch said, "It's all about a vision, setting goals and getting all the right people on the same bus and communicating our goals throughout the entire process. Focus is also a powerful tool to use as a leader, to quote Napoleon who said "I only see the end result; therefore all obstacles must give way." 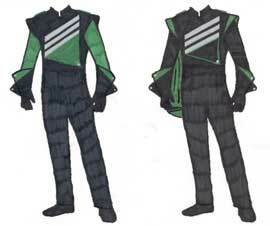 Sketches of the Strutters' new uniforms: Regular member (left) and drum major (right). Hirsch said the Strutters are most likely to get new uniforms for 2005. "First and foremost our look is going to change dramatically. Any impression anyone has ever had of the Strutters will be shocked to see us on the field this summer with new uniforms. It looks like Fred J Miller will be the makers; we had done some preliminary work last year with them," Hirsch said. Meanwhile, the Strutters are also in the process of outfitting their brass line with B-flat horns, Hirsch said, and the corps will be purchasing a new equipment truck. The Strutters are accepting application online at strutters.org, and their audition camp will take place from Dec. 3 to Dec. 4.